Our Riser Trophy Series make a popular choice for soccer teams of all ages and genders. This gold colored trophy features a large soccer ball with various designs on top. Choose from a wide range of soccer designs and figure selections, including designs showing two players, or choose from male or female single players. 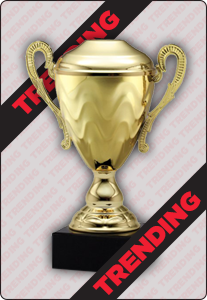 This celebratory trophy will encourage your players and congratulate them on their season success!